T IS 5:58 A.M., AND THE BIRDS begin to fly. First, a solitary drake, cutting across the deep cobalt of the predawn sky, its shadow black as it flits between the skeleton tree trunks reaching up, always up. Soon, his flock mates join him, moving from cover to forage. Their wingbeats are audible, squeaky-creaky like an aural dotted line traced across the sky. From the other end of the blind, a shotgun flares, sparks flying from the muzzle into the darkness, the smoke not yet visible. One of the shadows high in the air folds its silken wings and drops, elegantly but with finality, toward the water. “Scoop,” comes a deep-voiced command, and a jet-black male Labrador, responding to the word that is both his name and his signal, surges into the water. He has already marked the downed bird and swims inerrantly toward it. He disappears into the reeds, then returns, striking back for the boat without pausing. More shotguns blare as the dog clambers aboard, dropping the duck at his master’s feet before he spins, readying himself for the next run. He does not even bother to shake off. He is a working dog, as well as a prized pet, running the table on a series of ducks brought down for him by his flint-eyed master and the other hunters who’ve joined them this morning. Five hundred years and more of breeding have brought the dog—and his owner—to this point. It is an old game, one they have never lost. 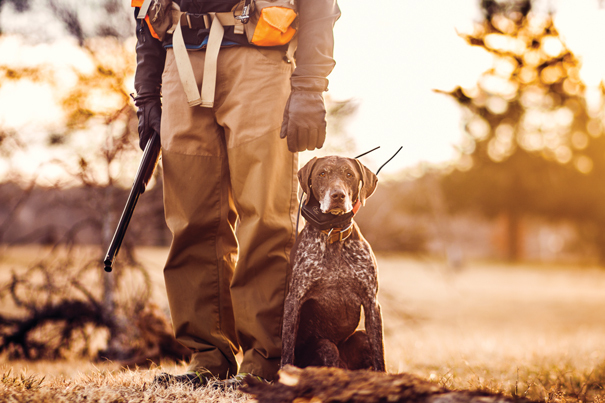 You can learn a lot about the inborn nature of a hunter—or maybe just of a person—by watching how he or she interacts with a dog. Sometimes, if you watch for a while, you can even get a little glint of the soul, like a bright feather hidden deep in a brushy covert when the sun hits it just right. In the forests and fields of our state, you’ll meet grizzled, old upland bird hunters, their chaps faded by the sun; science-minded breeders armed with the modern tools of nutrition and genetics; tough nocturnal swamp foxes; and land-striders always looking for the next horizon. Some view their dogs as prized tools, others as next of kin. With their Labradors, drahthaars and German shorthaired pointers, these passionate individuals pursue bobwhite quail, ringneck pheasants, mallards, wood ducks, teal, widgeons and pintails, even deer—a panoply of dogs in a never-ending palette of nature’s most beautiful conflagrations of fur, feathers and habitat. Yet for every variation of breed and environment, what holds true in every instance are the bonds they’ve made—and the stories they tell. 2 Responses to "Track & Field"
Fine piece. The high quality writing, wonderful photography and spot on feel for a fine dog/hunter bond allow me to overlook the obvious oversight of excluding the versatile Springer Spaniel. probably drove there in a BMW and drank a Warsteiner at the end of the hunt. Keep up the fine blog. We tried really hard to expand the selection but our photoshoot actually got rescheduled twice due to ice storms. As I recall I lost a Pointer and a Boykin and maybe a yellow Lab due to that.